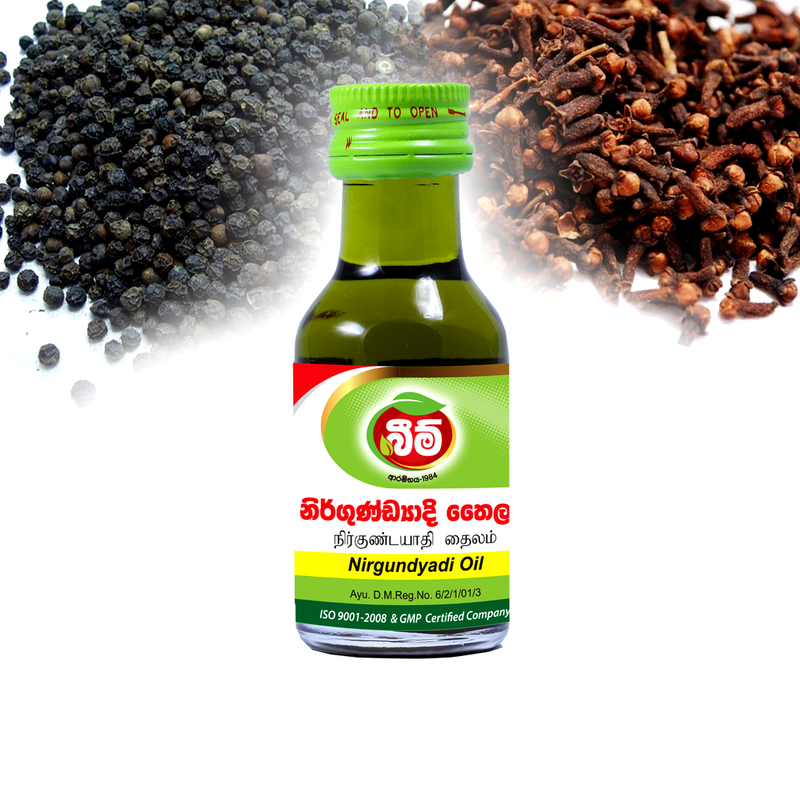 Ingrediants Dewadara (Erythroxylum monogynum) , Pepper (Piper nigrum) , Ginger (Zingiber officinale) ,Sadikka ( Myristica fragrans) , Kaluduru (Nigella sativa) , Sesame oil (Sesamum indicum) and etc. Therapeutic Effects Excellent for common cold, catarrh, headaches, migraine and headaches due to hypertension. Relieves rheumatoid arthritis and common body aches. Especially recommended for Nasya treatments. ගුණ: සෙම්ප‍්‍රතිශ්‍යාව, පීණස් රෝග සහ සාමාන්‍ය හිසරදයටත් අධික රුධිර පීඩනය නිසා හටගන්නා හිසරදයටත් හිසගැල්වීමට සහ නශ්‍ය කිරීමටත් ඉතා යෝග්‍යයි. ඇඟපත වේදනාව සහ සංධි වේදනා සඳහා ගුණදායකයි.